Rolling through hospitals are the ubiquitous carts that nurses use for everything from calculating lab results to transporting IV bags. In the near future, these carts will do more than simply wheel supplies. They’ll need to perform increasingly high-tech tasks, all while remaining easy for caregivers to move and clean, and still feel friendly to patients. Such was the challenge confronted by a new medical cart called Pocket, which debuted at this week’s NeoCon show in Chicago. 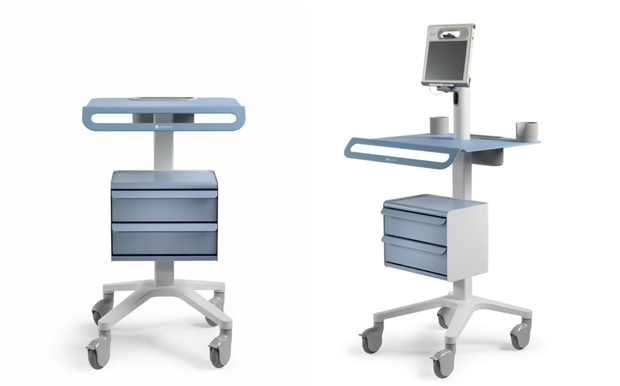 Created by a health care company called Modo, Pocket was designed by a division of Steelcase called Nurture to address the changing needs of nurses and doctors. Especially with the speedy arrival of electronic medical record-keeping, known as EMR, caregivers will need a mobile, personal workspace with Internet access as often as they need a stethoscope. If the above video is to be believed, nurses and doctors will be using iPads, not clipboards, to check patient histories.